In the early 2000s, filmmaker Ian McCluskey happened upon a roadside plaque in Wyoming commemorating an audacious 1938 river expedition by three young, French explorers. Intrigued, he delved into the topic and, after finding their journals, photographs and 16mm film, decided to retrace their route. The stories he uncovered and epic river trip that followed culminates in Les Voyageurs Sans Trace, a feature-length documentary that weaves the historic trek with the contemporary adventure and probes the enduring human desire to explore. Telluride Mountainfilm is excited to present two free screenings of Les Voyageurs Sans Trace on Wednesday, March 23, at the Wilkinson Public Library at 5:30 and 8 p.m., along with two fantastic shorts: The Thousand Year Journey and The Important Places. Mountainfilm Festival Director David Holbrooke said it’s been fun to watch Les Voyageurs, which was a recipient of a 2012 Mountainfilm Commitment Grant, grow from mere concept to fully realized film. 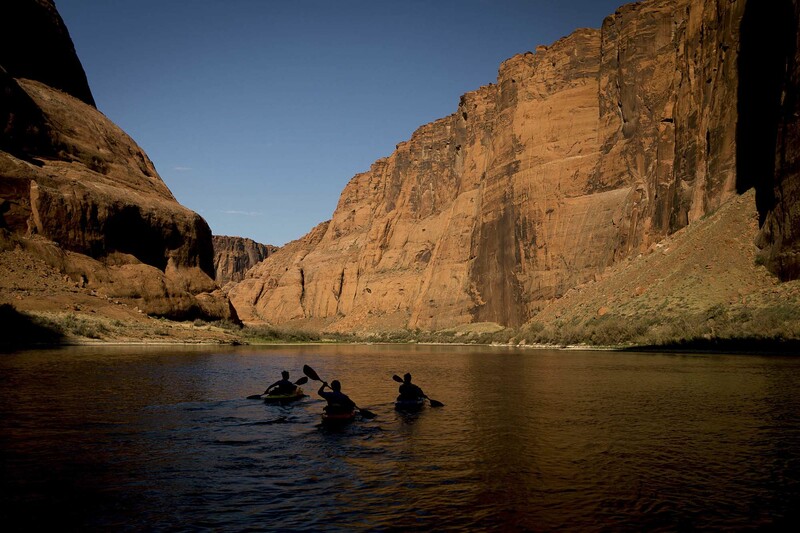 Les Voyageurs tells the story of two parallel kayak trips down the Green and Colorado Rivers. The first took place in the summer of 1938, when French newlyweds Genevieve and Bernard de Colmont and a friend, Antoine de Seynes, hatched a bold plan to be the first people to kayak the rivers. They launched from Green River, Wyoming, and emerged 900 miles and two months later in Lee’s Ferry, Arizona, having documented their journey on 16 millimeter color film — one year before Hollywood’s first color movie. The second journey unfolded when McCluskey, a novice boatman, convinced his kayaking friends, the American couple Paul and Kate Kuthe, to follow the French expedition with him. Along with examining the daring and pioneering journey that unfolded 75 years earlier, the modern explorers embark upon a great adventure of their own. Although much has changed between 1938 and 2012, much remains the same, including wild unknowns, overwhelming beauty and explorers documenting their journeys. All Mountainfilm Presents programs held at the Wilkinson Public Library are free and open to the public.